For anyone who has lost a child or has one to lose, El deshabitado—a true account in novel form—cannot be an easy read. The prose is often lyrical, the people undeniably real, but the steady beat of sorrow is always there: not only Javier Sicilia’s sorrow but also the sorrow of thousands who have lost loved ones to death or disappearance in a Mexico devastated by “la violencia” unleashed by a government war against drugs. Two years after his son’s death, arriving in an ancient abbey in France that is now a retreat from modern life, Sicilia still feels trapped in a diving bell, suffocating. Even with family and friends in this haven, he is as one returned from the dead, stripped of his human self – to use the French word, a revenant, or, as the title suggests, el deshabitado: the uninhabited. Long before the murder of 24-year-old Juan Francisco and six friends, Sicilia had thought deeply about the nature of evil. He was, after all, a life-long Catholic and wide reader; throughout the book he conjures up other writers who have faced evil – Hannah Arendt, Dante. Now he holds ideas about evil up to the firelight of his abbey room and finds them wanting. Explanations fail, evil remains – “as brutal and concrete as the body of one murdered, dismembered.” He no longer prays and has abandoned any idea of God intervening in history. He wrote his last poem after his son’s death, for how is poetry possible in in a world where political speech has emptied words of their meaning? Yet he finds he cannot abandon words altogether, and now, by the wood stove, he blows embers into flame, takes out a notebook and begins to write. The book he has written to bring himself back into life is a powerful narrative embodying not only his own story but the stories of other mourners who have joined with him in the Movement for Peace with Justice and Dignity. You can watch YouTube videos of their processions in Mexico and the United States. You can see Sicilia in his Indiana Jones hat addressing the crowds. And in El deshabitado you can go behind the scenes, listen to the conversations of men and women planning these processions and walking side by side in them, joining in a river of grief and protest that flowed into the very heart of Mexico City. It is impossible to suggest, in a few paragraphs, the depth of the book that has emerged from Sicilia’s clinging to words as a man might cling to a raft in a storm. Sicilia has spent a lifetime reading, thinking, joining with others in intentional communities, writing poems, novels, and essays. El deshabitado, more than 400 pages long, opens a window onto the spiritual life of a cosmopolitan man, who, with the death of his son, feels this lifetime of meaning-making crumbling around him and yet goes on, carrying his little grandson on his shoulders, the light of love flickering in the darkness. It is unfortunate that, as we in other countries experience our own violencia, for the time being only readers who know Spanish will be able to read his story. I’m writing to tell you about a project that Julie Landsman & I are developing in response to the rhetoric of xenophobia and isolationism that is becoming rampant in our country. In such an atmosphere, how can we find our voices and make them heard? One avenue is through poetry, that heart-cry that comes to us in times of love and crisis. Because my poem, “Where I’m From” has been used so widely as a writing model (most recently across Kentucky during my tenure as Poet Laureate)*, Julie–an educator, writer, and activist in Minneapolis–reached out to me with the idea of creating a national “I Am From” Project. Through Facebook**, a website, and a great network of teachers, librarians, writers, and community leaders, as well as other organizations, we hope to encourage and gather “I Am From” creations from all over the country and take them, in some form, to Washington in April of 2018. The action in D.C. will be a culmination of local readings and workshops, statewide presentations, radio and TV appearances, and more. We’re encouraging creation in many directions; poems, yes, but also dance, art, song, drama—expressions which can be videoed and shared with and beyond their local audience. In terms of poetry, one of Julie’s visions is a scroll made of “I Am From” poems wrapped around a school, a library, a state capitol. Another possibility is to put our poems on posters and have a river of poetry on the National Mall. Our deepest hope is to open a way for We the People to express who this country really is, what our values are, and how they unite rather than divide us. America’s embrace is wide enough to include all of us if we put our minds and money to our common welfare. Here’s to equality and hope. Here’s to all our voices! She sings but she sings the wrong song. She sings but she sings the song wrong. She sings but it’s not a real song. She sings but she should be ashamed. She sings but you don’t want to hear it. Someone else is working her mouth. She sings but it’s too soft to hear. She sings but it’s too loud to listen. She sings but she swallows the words. She sings but she belts it out. She sings but look where she does it. She sings but o my God that accent. She sings but did you see her teeth. She sings but look at those clothes. She sings but where are her children. She sings but you know about her mother. She sings but she stole that song. It’s not just her mouth she opens. She sings but she has no rhythm. she doesn’t have a man. She sings but her man is a woman. She sings when it’s not time for singing. She sings when we told her not to. We told her we want quiet. We told her to shut up. We showed her the gag. Kentucky Poet Laureate George Ella Lyon’s collections of poems include Many-Storied House, She Let Herself Go, and (with J. Patrick Lewis) Voices from the March on Washington. She is also a novelist and author of children’s books. The narrator’s voice held it all together – the scattered pieces of war: a voice deliberate, tense, holding hysteria back to give an account the narrator knows, knows without any question or doubt, must be given. It was urgently necessary that these things be told, said, understood. The Khesanh pieces were full of dread – death and dread and more death, that “laughing death-face” that hid behind the newsprint and lingered on the television screens after the news reports that denied its presence in the war. Death lingered on Herr’s every page: bodies, stacked, shoved into body bags, torn apart – the object of jokes and anguish and casual disregard. Death and love. Herr had loved the Marines, who were pathetic and fucked up and forlorn and abandoned and lost, but who had real heart. They were an embarrassment to any historical sense of masculinity, but there was something going on there, something that was very moving…. In fact, Herr was writing, but slowly. Elliott would come home and he would have the television on, and he would be lying on the sofa, and writing on a yellow pad: a few lines, dot-dot-dot, then a blank line, and a few more lines. He was trying to give the Esquire material a frame that would make Dispatches a book – a real book with a narrative that he that he could tell was there, even if no one else could. But the high that had carried him almost all the way had come to an end: he had come home from his adventure in Vietnam, virtually the only one of his New York set who had gone to Vietnam, and he had come home unhurt, full of energy and ego and vanity. “And I knew I was being told something of extreme profundity. It really made my blood run cold. Michael Herr talked with me about writing Dispatches when I visited him and his wife Valerie Elliott at his home near Syracuse in late September, 1993. This passage is an excerpt from my book, It Wasn’t Pretty, But Didn’t We Have Fun: Esquire in the Sixties (W.W. Norton, 1995). I’ve posted Kentucky Poet Laureate George Ella Lyon’s sharp-edged poetic response to the November election in Kentucky. You can read it HERE. Growing up as a missionary child in West Africa, Carol Claxon Polsgrove was raised to be American, but Yoruba voices filled her days and talking drums her nights. 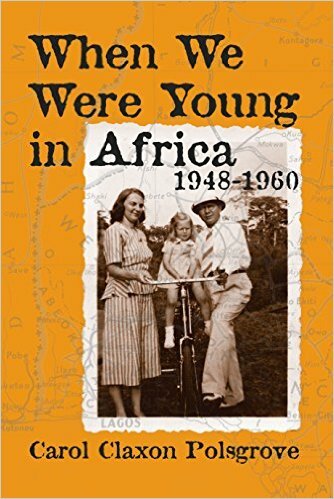 Lifting the veil of stereotypes about missionary life, When We Were Young in Africa offers an intimate account of coming of age at a crossroads of cultures. “Part of the legacy of Carol Polsgrove’s childhood is a sense of being between worlds, clearly not African but not fitting in the United States either. Nor is she at home in the evangelizing Christianity of her parents. But in this memoir, brimming with the sounds and smells, the voices and spirits of over sixty years ago, Polsgrove comes to see the unity that links the two continents of her life and, in doing so, to embrace her becoming as it shapes her ongoing.